If your memory is not what it used to be, you may have one or more of these 3 factors. Here's the latest scientific research on how to undo the damage, and get your memory back in as little as 30 days. Many of us joke about "senior moments." But when they start happening to you more often, they're not funny at all. Instead, they're frustrating, embarrassing, and perhaps even worrisome. For example, do you ever walk into a room — and forget what you went in to get? Run into someone you haven't seen lately — and can't recall their name? Misplace your glasses or your house keys? It's ironic. Just when you've got all this wisdom and experience under your belt, your brain is no longer "old reliable." You never know when it's going to trip you up, frustrate you, embarrass you, or make you wonder if you're starting to lose your marbles. Researchers at Harvard, Stanford, Johns Hopkins, Duke, UCLA, and other top universities recently discovered three hidden triggers that cause frequent memory lapses and mental decline. They're the missing link scientists have been seeking for years! And thanks to a new breakthrough, it's now possible to switch off these hidden triggers — and even reverse years of brain aging. That means you can enjoy a "steel trap" memory, crystal-clear thinking, and laser-like focus. You know what it's like to forget a name, misplace your keys, or lose your train of thought. Now scientists know why these memory lapses happen: they're due to a common brain-wiring snafu that starts in middle age. This brain-wiring snafu makes it harder to send vital messages from one part of your brain to another. Somewhere along the line, they get hopelessly lost. And suddenly, you can't remember for the life of you where you parked your car. So what makes your brain wiring go haywire? It all has to do with the white matter that protects nerves, called myelin. Myelin is like the rubber that covers electrical wires. If the rubber wears down and the wires become exposed, they fray and become damaged. Once this happens, they don't conduct electricity as well. The same thing happens with myelin in your brain. Myelin protects your nerves, so messages can travel along them without getting corrupted, scrambled, or diverted along the way. But the problem is, myelin starts to wear out as you get older. According to UCLA researchers, as myelin deteriorates, nerve fibers begin to fray. These frayed nerves don't transmit messages as well. As a result, you become more and more forgetful. To add insult to injury, you also produce fewer neurotransmitters as you age. Neurotransmitters are brain chemicals needed to promote memory, enhance learning, and calm your mind so you can concentrate. They're the fuel your brain needs to run. When the myelin in your brain starts to wear out, you produce fewer neurotransmitters. That's because you only make these vital brain chemicals whenever a brain cell receives a message. If your brain cells aren't receiving messages due to worn-out myelin, you're not going to make enough neurotransmitters. This means you're stuck with worn-out myelin AND a deficiency of neurotransmitters, often by the time you hit middle age. So what does this cruel combination do to your memory and thinking? Harvard University researchers wanted to look at the effects of these brain-wiring changes. So they studied a group of younger and older adults between the ages of 18 to 93. They had the adults perform various tests on memory, thinking, and learning. But that's not all. The researchers also took pictures of the people's brains using a test similar to an MRI. They found the older adults had more myelin damage and fewer neurotransmitters than the younger adults did. Believe it or not, you may be carrying 300 to 1,000 times more lead in your body than your oldest ancestors. That's because if you were alive during 1945 and 1971—the period of greatest lead use in history — you were likely exposed to high amounts of lead. Add to that the lead in your drinking water, paint, computer monitors, televisions, vinyl blinds, ceramic mugs, auto exhaust, toothpaste, and hundreds of other everyday items and you can see how this toxic heavy metal can build up in your body. To look at the effects of all this lead on your brain, Johns Hopkins University scientists conducted a 4-year study. They found those adults with higher blood levels of lead had greater age-related declines in brain function. The leader of the study described it as "like five more years of aging on the brain." Research shows long-term exposure to lead triggers mental decline two ways. First, it destroys myelin-producing cells needed to keep the myelin healthy. It also blocks neurotransmitter development, so your brain makes fewer of these memory chemicals. It's no wonder decades of lead exposure can speed up brain aging and trigger serious mental decline. But lead isn't the only heavy metal that damages your brain. Scientists now know much more about the toll mercury takes on your brain. A recent study at the University of Calgary Medical School found that even trace amounts of mercury—similar to that found in dental fillings—destroy nerve cells in your brain. These days, mercury is everywhere—including fumes you breathe at the gas pump, contaminated fish and seafood, cosmetics, air conditioner filters, and of course, dental fillings. You're also constantly exposed to aluminum, arsenic, pesticides, and other toxins linked to mental decline and memory problems. The good news is, you can do something to fend off the damaging effects of heavy metals and other toxins on your brain. Advanced Memory Formula can boost your memory and protect your brain as you age. So not surprisingly, the older adults' brains didn't transmit messages as well. This explains why they didn't score as high on the memory tests as the younger adults. Senior moments are bad enough. But you may also have noticed you're more easily distracted. Perhaps your mind wanders when someone is talking, or you can't stay focused on what's in front of you. A group of researchers decided to look at why people get more distracted as they age. So they took a group of young adults aged 18 to 30, and a group of older adults aged 60 to 77. Each person performed a simple memory test — with a twist: while the memory test contained information to help people complete a mental task, it also contained information meant to be distracting. The researchers found that the younger adults had no problems blocking out this irrelevant information. But the older adults had a harder time not being distracted by it, or couldn't block it out at all. So they didn't do as well on the test. When the researchers looked at why the older adults couldn't block out this information, they made a surprising discovery. The older adults' brains were slightly slower than the younger adults' brains, by about 200 milliseconds. The difference is very slight, but it's all it takes to weaken your memory and focus. Just a fraction of a second can interrupt a memory in the making — whether it's forgetting what you walked into a room to get, or what you were about to say. So that train of thought gets completely lost instead of ending up in your "working memory." Working memory is that mental space at the forefront of your mind. It's where you put information you want to have available, but you're not sure yet if you need to store it long-term. It's similar to RAM, or Random Access Memory, in a computer. RAM allows your computer to work with more information at the same time without storing it. When your working memory is working properly, it helps you block out distractions…keep focused on a task so you can finish it…stay on track during conversations...play games like chess…and avoid misplacing your glasses or car keys. The problem is, your working memory is vulnerable to a little-known age-related threat:inflammation. Just as inflammation can run amok in your joints or other parts of your body, it can run amok in your brain. And the trigger is often foods, toxins, allergens, or even stress. This repeated exposure cause powerful immune cells in your brain to produce more inflammatory chemicals than you need. These excess inflammatory chemicals then go into overdrive. They kill off perfectly healthy neurons, or brain cells — and take a direct hit on your working memory. Long before you start to notice memory lapses or trouble focusing, other changes are happening in your brain. These changes are due to decades of exposure to free radicals and other toxins. As you may know, free radicals are unstable molecules that react with oxygen in your body. It's as if they rust out your brain. Over time, this build-up of brain rust damages your cells. It can also cause dangerous amyloid plaques to form in your brain. This brain rust also destroys mitochondria, the energy-producing power plants in your cells. As a result, your brain doesn't make enough energy to work efficiently. This makes your brain slow down even more. What's worse, you're also exposed to heavy metals and toxins like lead, mercury, aluminum, arsenic, pesticides, and others that poison your brain and speed up mental decline. And studies show the damage from these toxins begins years before you notice any symptoms. You can see how even a normal, healthy person can't avoid the natural consequences of aging on the brain. Inflammation kills off healthy brain cells…your brain wiring doesn't work as well as it used to…your brain gets slower…and decades of free radicals attacking your brain begins to take its toll. But now there's an easy way to combat inflammation, correct this brain-wiring snafu, make your brain work faster, and minimize the damage done by free radicals and toxins. My name is Dr. Frank Shallenberger, and I'm a practicing M.D. I'm also editor of the popular health advisory Second Opinion and past editor of Real Cures. For years, my patients and readers have asked me for a solution to their memory problems. I've always recommended a healthy diet and regular exercise. But there are now dozens of exciting studies that show several cutting-edge nutrients can make a dramatic difference. 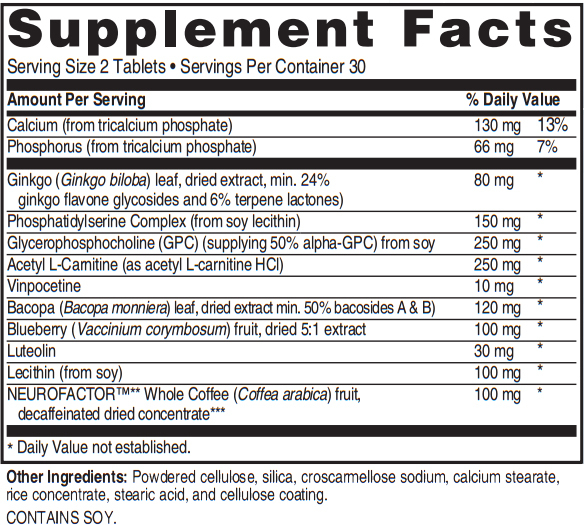 I wanted to find a supplement I could recommend that contained these powerful nutrients. I looked at dozens of memory supplements on the market. But when I compared their formulas to recent studies, all of them fell short. They were either out-of-date, left out some of the most important ingredients, or skimped on potencies. That's why I helped create my own formula I could use with patients and recommend to others. It's called Advanced Memory Formula and contains the most cutting-edge nutrients for memory and brain health. Tens of thousands of people have used this formula to boost their memory and focus, enjoy enhanced mental clarity, and protect their brains against the many threats we face as they age. That's because Advanced Memory Formula helps you reverse the three hidden triggers for mental decline I just told you about. I explained earlier how the myelin in your brain begins to wear out and you don't produce enough neurotransmitters as you age. These changes affect your brain wiring and lead to memory loss, fuzzy thinking, and brain fog. A one-nutrient formula can't do it all. You can't expect one single nutrient to give your brain total support and counteract the multiple causes of brain aging. Different parts of your brain have different functions, and nutrient deficiencies affect them in different ways. So if you're just taking PS or gingko biloba, you may see a slight improvement, but not nearly as much as if you cover all your bases. "Kitchen sink" formulas that are all hat and no cattle. Some memory supplement makers throw in everything but the kitchen sink. Then they don't even tell you how much of each nutrient they've put in. So you have no idea if you're getting enough to make a difference! Plus these supplements are often loaded with vitamins and minerals that are already in your multivitamin. Skimping on potencies and leaving out crucial nutrients. Some memory supplements give you a mix of key nutrients. The problem is, instead of using clinically proven potencies, they put in just enough for "window dressing." While this may maximize their bottom line, they're still missing key ingredients proven to actually boost your memory and protect your brain. It's no wonder you don't notice a difference when you take these companies' supplements. You can't boost your memory with a weak-strength supplement—or one that leaves out crucial nutrients your brain needs for peak support as you age. I created Advanced Memory Formula to give you a total solution for memory and brain support that will work for you. This all-in-one supplement gives you double or more the amounts of cutting-edge nutrients you'll find in other popular formulas. But now scientists have discovered three powerful nutrients that put your brain wiring back on track. These nutrients actually rebuild worn-out myelin and increase your production of neurotransmitters! You get all three of these nutrients in Advanced Memory Formula. The first nutrient is similar to L-Carnitine, an amino acid that boosts energy production in your body's cells. It's called Acetyl L-Carnitine, or ALC for short. While L-Carnitine energizes and supports your heart, ALC does the same for your brain. That's because ALC crosses the blood-brain barrier and gets into your brain cells. It also repairs damaged mitochondria, which helps your brain work more efficiently. That's right, research shows ALC rebuilds worn-out myelin. This means your brain can send messages more easily so you feel quicker on your feet…even if you've already started to notice memory problems. In fact, Stanford University School of Medicine did a study of 334 adults — all of whom were suffering from serious mental decline.1 Researchers were stunned by the results. Those adults taking ALC became less forgetful and showed fewer signs of mental decline than those taking a placebo. That's pretty incredible for people already suffering from serious memory problems. In spite of this study and many more like it, supplement makers often skimp on this crucial nutrient or leave it out completely. But I made sure I included ALC in Advanced Memory Formula. And it's in a potency that can make a dramatic difference in your memory and focus. Starting in middle age, your brain begins to make fewer neurotransmitters. One of these neurotransmitters is acetylcholine. You need acetylcholine so you can remember what you walked into a room to get…find your misplaced car keys…or learn someone's name and recall it later. To make acetylcholine, your brain requires a nutrient called choline. But you don't get as much choline to your brain as you get older, since your body has a harder time breaking it down and using it. So you often end up with a choline — and acetylcholine — deficiency. The good news is, when you increase the amount of choline that gets to your brain, it has a dramatic effect on your memory. In a recent study involving adults ages 50 to 80, those who took choline reported having HALF as many "senior moments" — such as forgetting names or losing things — as before. Choline is so powerful at boosting your body's production of acetylcholine, research suggests it can create the equivalent of a "super brain," with long-lasting effects. A Duke University study showed that giving choline to rats produced vastly superior brains with more neuronal connections.2 The rats demonstrated increased learning ability and better memory recall, both of which lasted into old age. How to give yourself a "super brain"
You can take choline in supplement form, but it often has a fishy smell or taste to it. That's why I recommend a better form of choline that doesn't have this fishy smell or taste. What's more, it gets into your brain much more easily than pure choline. This better absorbed form is Alpha-Glycerylphosphorylcholine, or Alpha-GPC. I included the ideal amount in Advanced Memory Formula. When you take Alpha-GPC, your brain starts producing more acetylcholine almost instantly. In no time, your mind can feel as crisp and clear as it did decades ago! Over 20 studies involving more than 5,000 patients have shown repeatedly that Alpha-GPC increases alertness, boosts learning, and revitalizes mental performance. What's more, studies show it can even improve memory and mental clarity in people with severe mental decline. If Alpha-GPC can have such a dramatic effect in these serious cases, imagine what it can do if you're simply putting up with occasional forgetfulness and brain fog. Before long, your friends and family will marvel at your steel-trap memory! If you often can't remember what you went to the grocery store for or have a hard time staying focused, it could be because your brain isn't making enough GABA. GABA is a crucial neurotransmitter that calms your mind and filters out distractions. When you don't make enough of it, your thinking gets cloudy and you have trouble concentrating. The good news is, you can easily boost your body's production of GABA with a natural herb. This herb is called bacopa monnieri, or bacopa for short. In ancient India—more than 6,000 years ago—the Rishi holy men were famous for their astounding memory abilities. The Rishi were able to reel off hours of prayer and recite epic poems completely from memory, without pausing. One famous oral history, the Rig-Veda, contained 1,028 hymns—and each one took eight hours to sing! Another classic poem, the Mahabharata, took several weeks to recite in Sanskrit. When finally translated to written form thousands of years later, some of these epics contained nearly 9,000 pages of text. But the Rishis were able to recite them word-for-word! These amazing memory powers were all due to a wild herb that grew on the banks of the River Ghanges. What was this herb? Bacopa monnieri. Several studies prove this herb's dramatic effects on memory. Bacopa contains memory chemicals that help your body make more GABA. They also repair damaged nerve cell connections, so your brain can send and receive messages more easily. At least 14 recent studies confirm bacopa improves memory and boosts retention of new information.3 In one study, researchers found people who took bacopa did a better job of recalling lists of 15 words after they were read aloud.4 They also had an easier time blocking out distractions. Another way bacopa improves memory is to soothe frazzled nerves and help you handle stress better. Stress affects your memory, making you more forgetful and even accident-prone. So reducing stress actually boosts your mental performance! I've also included a potent, antioxidant-like compound, called luteolin, in Advanced Memory Formula. Luteolin is found in many plants, including carrots, peppers, celery, and rosemary. New research shows luteolin bulletproofs your brain cells against killer toxins. It also restores working memory. That's because unlike most other plant compounds, luteolin is able to cross the blood-brain barrier. So it actually gets into your brain. This allows it to block the production of inflammatory chemicals that destroy healthy brain cells. Here are the amazing results of one recent study, published in the Journal of Nutrition.6 Researchers looked at the effect of luteolin on immune cells in the brain. They took some of these immune cells and exposed them to a toxin. The immune cells reacted to the toxin by increasing their production of inflammatory chemicals. These chemicals then killed the surrounding brain cell — almost immediately! Now here's the amazing part. The researchers then repeated the experiment, but with a twist. Before adding the toxin, they treated the immune cells with luteolin. Result: The cells treated with luteolin didn't make nearly as many inflammatory chemicals — and the surrounding brain cells survived! The researchers next turned their attention to the effects of luteolin on working memory. They gave older mice and younger mice either a control diet or one that included luteolin. After four weeks, the researchers had the mice swim through a water maze. They then gave the mice a series of clues to help them find a hidden platform to exit the maze. Result: The mice that were fed luteolin found the platform much faster than the mice that were not fed luteolin. And here's something even more remarkable: The older mice that were fed luteolin performed better than younger mice! Researchers believe luteolin can have the same anti-aging effects on working memory in humans. I just told you how Advanced Memory Formula helps repair worn-out myelin, restores lost neurotransmitters, makes your brain wiring work better, and limits brain inflammation. Now let me explain how this formula can help improve the function of brain cells and help you feel sharper than you did in your younger days. You know that mental lift you get when you go for a jog or a brisk walk? Thanks to a new discovery, you can get the same brain-boosting effect you get from exercising. It not only can help keep your brain young, it can protect your memory and boost your mental performance. This new discovery is called NeuroFactor™ and I've just added it to Advanced Memory Formula. That's because this powerful, newly-discovered ingredient is the first and only natural compound that's been shown in human studies to do something amazing. It significantly increases a memory-boosting protein called "brain-derived neurotropic factor," or BDNF. BDNF is the master molecule in your brain that helps build the complex infrastructure in your brain. The more BDNF you have, the more brain cells your brain makes and the stronger the connections between them. Not only does this sharpen your memory, focus, and alertness, it can improve how you perform skilled tasks, like driving a car. Studies show your brain's BDNF levels get a big boost when you do vigorous exercise. In fact, until now intense exercise was the only natural way to raise BDNF levels significantly. But thanks to NeuroFactor™, you can dramatically increase BDNF without exercise. This powerful, newly-discovered ingredient is the first natural compound that's been shown in studies to significantly increase BDNF in humans. In a double-blind, placebo-controlled human clinical study — the "gold standard" of research — NeuroFactor™ increased BDNF by 143% on average.7 And that was within just two hours….with one 100 milligram dose! What's more, this all-natural compound is such a potent antioxidant, just one gram gives you the same free radical fighting power as 625 grams of fresh blueberries…974 grams of strawberries… 1,230 grams of raspberries…or 2,030 grams of grapes! You may think since NeuroFactor™ is derived from a coffee plant, it's the caffeine that makes you feel sharper. But this brain-boosting extract contains only trace amounts of caffeine—about as much as you'd get in a cup of decaf coffee or tea. What makes NeuroFactor™ so powerful is the fact that it's derived from the whole fruit of the Coffea arabica plant. So it contains thousands of beneficial compounds and phytochemicals found only in the fruit of the plant. It's these non-caffeinated components that naturally boost BDNF levels…and neutralize toxic free radicals that speed up brain aging. As I explained earlier, your brain gets gradually slower as you age. You may not feel as sharp and on top of things as you used to. But now there's a way to speed up your brain — and make it work like the efficient machine of your youth. The secret is to make the cell membranes in your brain as healthy as possible. Cell membranes are a kind of "skin" that surrounds living cells. But they do much more than protect cells and keep them intact. Cell membranes are the unsung heroes that pump waste products like free radicals and toxins out of your brain cells. They also ensure proper cell-to-cell communication, so your brain can send messages more easily. When your cell membranes aren't healthy, they can't do these important jobs. As a result, the neurons that cell membranes are supposed to protect don't work properly. This slows your brain response, making you more forgetful and less focused. Now there's an easy way to keep your cell membranes healthy — and your brain sharp as a tack. How? By taking a nutrient called phosphatidylserine or PS for short. PS is a healthy brain fat that is the building block in all cell membranes. You can't have healthy cell membranes without it. The problem is, your body naturally makes less PS as you age since you usually produce less energy. You don't get much PS from your diet either, because it's not found in most foods. So you can see why it's so important to supplement with PS, particularly if you've begun to notice memory problems. And it can make a big difference fast. Just look at some of the incredible results seen in studies. In one study, scientists looked at 149 patients aged 50 to 75. All of the patients had been suffering from memory loss. They gave half the patients PS and half a placebo. After just 3 weeks, those taking PS showed noticeable improvements in memory and learning. Click here for an easy way to provide your mind with these essential nutrients — and never feel lost "in the fog" again! Can reduce your "brain age"
These results were so impressive, the researchers decided to look further. They found that after 12 weeks, those people taking PS had an easier time concentrating, remembering telephone numbers, paying attention while driving, and finding misplaced objects. In fact, while the average age of the participants was 64, their "brain age" tested at 52. This means they tested as if they were 12 years younger! Another study found nearly 9-in-10 people with impaired memories who took PS noticed a major improvement in just 6 weeks.8 Plus at least 61 clinical trials and 2,800 research papers show this supplement can improve memory, attention, verbal fluency, and overall mental function. It's probably no surprise that when your brain doesn't get enough oxygen, your memory and thinking suffer. Well, guess what? Right now your brain could be starving of oxygen! You, too, can notice a difference in your memory, thinking, and focus…just like these happy Advanced Memory Formula customers! These are actual letters we received from users of Advanced Memory Formula. Based on studies, the average user could expect a 44% improvement in memory retention and word association ability, just from taking this supplement. Feel sharper and more alert! "I'm 79 years old. I was becoming forgetful when I was excited, frustrated, or depressed. With Advanced Memory Formula, I have better memory recall under stressful situations and it keeps me more alert. It is so frustrating not to be able to say what you want. I keep going back to Advanced Memory Formula because it helps." "I am a 74-year-old retired engineer. My memory has improved so much that I can recall things my parents used to say when I was 5 years old. I can recall formulas without resorting to the handbooks. Thank you for such a wonderful product!" "I feel that I was hesitating before remembering people's names. Also, I had to stop and think what I had started to say. I do not do that any more and I'm as sharp as I have ever been. I really think this product has helped me!" Forgetfulness gone in a week! "I would start to get something and forget what I was after. One week after I started taking Advanced Memory Formula this cleared up. I can also concentrate longer now. Thank you!" "I have noticed a difference in my memory almost immediately within a week or so. My memory has always been very good, but my Advanced Memory Formula has put a sharper edge to it." As you age, your circulation becomes more sluggish. When you don't get enough blood flow to carry oxygen to your brain, you can suffer memory loss and even serious mental decline. The good news is, scientists now know how to reverse this common effect of aging. They've discovered an extract from the periwinkle plant can boost blood flow to your brain—and give it the increased oxygen it's starving for. This extract is called vinpocetine and it's been researched and used in Europe for more than two decades. Studies show it helps people recall new information more easily and feel more focused. Even people suffering serious mental decline notice a difference! In one study, elderly patients with serious memory impairment took either vinpocetine or a placebo.9 Of those who took vinpocetine, 100% scored better in memory tests after just 3 months compared to those who took the placebo. You heard me right, 100% of people who took vinpocetine saw an improvement! It's no wonder I'm convinced vinpocetine can make a big difference in your memory and thinking. Before long, you'll notice fewer frustrating searches for misplaced objects, fewer embarrassing moments forgetting names and faces, and fewer senior moments! You get the same amount of vinpocetine used in studies in Advanced Memory Formula to keep your brain sharp and energized. Click here to support your memory, concentration and attention span…and leave that grocery list at home! It's impossible to avoid the third hidden trigger for premature brain aging — a build-up of brain rust. This brain rust is due to decades of exposure to free radicals and other toxins. Over time, this constant onslaught of free radicals and toxins takes its toll. It kills off nerve cells. It disables neurotransmitters. And it causes memory-destroying amyloid plaques to form on your brain. You already know antioxidants help ward off the effects of free radical damage. One of the most powerful antioxidants on the planet is the common blueberry. USDA researchers now know blueberries have the highest levels of free radical fighters compared to over 40 other fruits and vegetables. Blueberries are packed with potent plant compounds called anthocyanins. Anthocyanins are so powerful, they contain four times the free radical-fighting power of vitamin C.
Even more important, blueberries are one of the few antioxidants that destroy free radicals that attack your brain. They also combat inflammation, protect neurons, and fend off amyloid plaques. The researchers split the people up into two groups. One group consumed blueberry juice each day, while the other drank a placebo. Result: Those who drank blueberry juice scored much higher on learning and memory tests. That's right, from simply drinking juice! You can see why researchers believe blueberries may be the ultimate memory food. But not everyone can eat enough fresh blueberries every day or drink glass after glass of blueberry juice to enjoy their brain-boosting effects. That's why I included a concentrated blueberry extract in Advanced Memory Formula, so you can easily ward off free radicals and make your brain "young" again. As you may know, the herb ginkgo biloba is good for circulation. Ginkgo biloba has long been used in Chinese medicine to boost memory and heart health. And alternative doctors have recommended it for decades. Because gingko biloba increases circulation, it floods your brain with energy and speeds up mental performance. But it plays another important role. It protects vulnerable neurons and brain tissues from free radical damage. That's because this well-researched herb has powerful antioxidant-like properties. You can see how just about anyone can benefit from using this memory-boosting herb. It also offers you wonderful "side" benefits, like better circulation and fewer allergy symptoms. You get a high-quality, standardized form of ginkgo biloba in Advanced Memory Formula. Think of all the different ways you depend on your brain. Not just for remembering names and important details, but to perform your job or hobbies, maintain your independence, and simply enjoy life. Let's face it. You don't want to become dependent on your children…lose your ability to drive… forget your happiest memories…or end up in a nursing home. Now you can do something to keep these nightmares from happening, so you can live a fulfilling, independent life as you age. As I've explained, it's entirely possible to ward off the three hidden triggers for mental decline and even reverse them. By taking Advanced Memory Formula each day, you'll harness the power of the latest nutritional research to give your brain maximum support and undo the damage done. When you take this breakthrough formula, it's like turning on a switch and having a light go on. Neurons in your brain start communicating better…your brain response speeds up…and you have an army of defenders protecting your brain! #9: Gingko biloba—to energize your brain and improve mental performance. You'll love the convenience of getting these nine powerful nutrients in one, easy-to-swallow tablet, in a form that's easily absorbed by your body. Plus you'll save money since this formula is such an excellent value. Other memory supplements that cost the same or more shortchange you on potencies—or leave out crucial nutrients. But I've made sure I included all of the most effective memory-boosting nutrients shown to work in the latest studies—in the same or similar potencies to bring you results! I wouldn't recommend this supplement if I didn't believe it offers you the most powerful solution available for improving your memory. Remember, I take Advanced Memory Formula myself and recommend it to patients, so I made sure it's the best. I also made sure you get only the highest-quality ingredients and most effective nutrient forms in Advanced Memory Formula. Studies show these nutrients can help you enjoy sharper memory and focus. Why wait to enjoy better support for your memory? … sleep peacefully without worrying your memory problems may rob you of your independence or land you in a nursing home. Many people who take Advanced Memory Formula begin to notice these wonderful changes within the first month. Of course, the longer you take it, the sharper you'll likely feel. And most importantly, you'll be giving your body all the firepower it needs to protect your brain and fight the most common triggers for mental decline. That's why I want to make it as easy as possible for you to get started today. 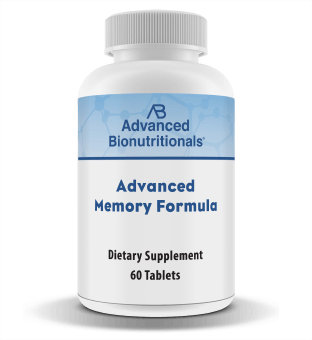 I personally arranged for Advanced Bionutritionals, the company that makes Advanced Memory Formula available to my patients and readers, to offer you special introductory savings. Save $6.70 per bottle…without risking a penny! When you choose their "best value" deal and request the six-month savings pack, you'll save a whopping $6.70 per bottle. That adds up to a total savings of $40.20! Plus, with our "Best Value" offer, you'll also get FREE shipping and handling (worth $6.95) when you act right away. If you select the "great value" offer and request the 3 month savings pack, you'll save $4.00 per bottle. Finally, a Trial Offer is available for $39.95 + $6.95 shipping and handling. If you're not 100% satisfied for any reason, send the empty bottles back within 90 days of your purchase for a full refund — including shipping and handling! You only pay return shipping. If you're not convinced Advanced Memory Formula has improved support for your memory and concentration…or if you're not satisfied for ANY reason…you can return it within 90 days for a full refund of the purchase price, including shipping and handling charges. You probably won't find a rock-solid guarantee like this anywhere else. Most companies only give you a 30-day or 60-day money-back guarantee. And if you try to return a supplement you've already opened to a store, in most cases you'd be out of luck! So why am I willing to offer you this unmatched guarantee? Because of the dozens of clinical studies I've combed through that prove beyond a shadow of a doubt this formula will work for you. Because of the truckloads of letters I've received from satisfied customers who have seen extraordinary results. And because of the remarkable improvements I've seen this formula make in the lives of my patients — and myself. Please take advantage of this special opportunity to discover what Advanced Memory Formula can do for you…and your quality of life. You have my word that every bottle is 100% guaranteed or your entire purchase price will be promptly refunded within 90 days of your purchase. You won't risk anything by giving this total memory solution a try! You can also call us toll-free at 1-800-791-3395 to have Advanced Memory Formula rushed right to your door. Our health consultants are available to help you 24 hours a day, seven days a week. P.S. Advanced Memory Formula is the only supplement I know of that gives you the nine most powerful, well-researched nutrients proven to boost your memory and concentration, and limit brain aging. Now you can try this total memory solution without risk, at special savings of up to $6.70 per bottle. Place your risk-free order now. Save $10.00 per bottle and get 3 FREE gifts…without risking a penny! FREE REPORT #3: Breakthrough Cures for Osteoarthritis, Rheumatoid Arthritis, and Gout—the latest discoveries that can help you finally become pain-free and get back your joy of living. On top of these valuable gifts, you'll also get FREE shipping and handling (worth $6.95) when you act in the next 7 days. On top of these valuable gifts, you'll also get FREE shipping and handling (worth $6.95) when you act right away. However, you will get FREE shipping and handling (worth $6.95) when you act right away. Yes, I want to support my memory, so please rush Advanced Memory Formula straight to my door.